Starting tomorrow, Ford GoBike users will find electric bikes in Oakland, Emeryville and Berkeley. Ford GoBike announced today that it's set to add more than 500 pedal-assist e-bikes to its existing East Bay stations. The new bikes, dubbed Ford GoBike Plus, feature motors that give riders a boost as they pedal. "The pedal-assist makes longer, uphill bike trips easier than ever, giving East Bay residents more reasons to choose bike share to get around their communities," Emily Stapleton, Ford GoBike general manager, said in a statement regarding the launch. Just like the Ford GoBike Plus bikes launched in San Francisco this past April, the East Bay's new e-bikes can be unlocked with a Clipper card or the Ford GoBike app, and can be returned to any of the 127 bikeshare stations within Oakland, Berkeley and Emeryville. Access to Ford GoBike Plus bikes is included with single passes and GoBike memberships. To celebrate the release, FordGo Bike is hosting a launch event and inaugural ride at 10 a.m. tomorrow, starting at the FordGo Bike station at 23rd Street and Telegraph Avenue in Oakland. Oakland Mayor Libby Schaaf, Berkeley Mayor Jesse Arreguin and Emeryville Mayor Ally Medina are all expected to attend, as well as representatives from the Oakland Department of Transportation, Bike East Bay and Lyft -- which acquired Ford GoBike's parent company in July. 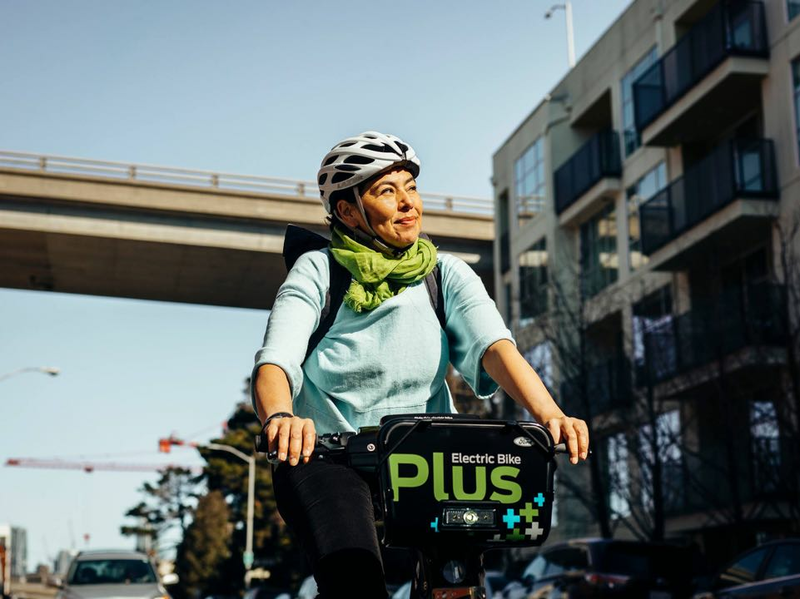 "We are thrilled to be getting electric-assist, shared bicycles in Oakland, Berkeley and Emeryville," Oakland Mayor Libby Schaaf said in a statement. "Bikesharing already gives the Bay Area a non-polluting, affordable way to get around - but these e-bikes will be useful to a wider range of people, including folks who maybe can't pedal comfortably on their own." According to Ford GoBike, the bikeshare network currently has more than 300 stations and 3,000 bikes in use across San Francisco, Oakland, Emeryville, Berkeley and San Jose. The system, formerly known as Bay Area Bike Share, aims to become the second-largest bikeshare system in North America with 7,000 bikes across 546 Bay Area stations.